I have pulled together a selection handlebar, trunk, rear and other panniers for road bikes to fit your needs whatever your budget. Having the right panniers just makes for a more enjoyable ride by having space to store items, no more awkward backpacks. 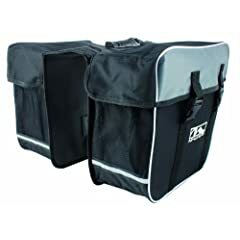 You may find as I do I have one set of panniers for touring, another for day rides and so forth just makes for a better ride so check out these bike panniers for your own rides. 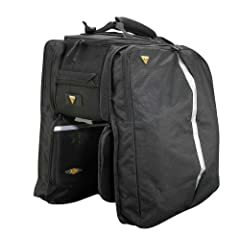 The most important thing is to choose the TYPE and SIZE of bicycle panniers or bags that fit your styles of cycling whether it be bike commuting, bicycle touring or recreational riding. There is not one fits all pannier. 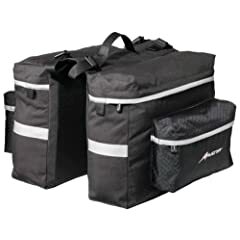 The best panniers for road bikes vary in size as it depending on whether you are using them for bicycle touring, grocery shopping or commuting.After considering capacity look at things like water resistance, mounting and pockets. 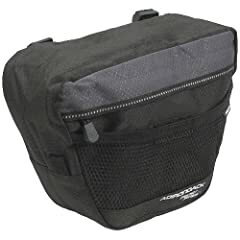 Having a handlebar bag for road bikes is handy for carrying smaller items such as a camera, cell phone, snacks, extra tire tube when you are riding. When purchasing consider if they feature a clear map sleeve on top, the capacity, shoulder strap to carry when off bike. 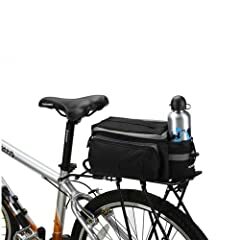 This handlebar bag is water resistant and some offer extra pockets which can be handy as well.